Pam has written children's books and television scripts; hundreds of radio and TV commercials; multi award-winning documentaries on Queensland dinosaurs, Australian ecosystems, bilbies, the Crown of Thorns starfish and buried Chinese terracotta warriors; short stories; and freelance journalism. 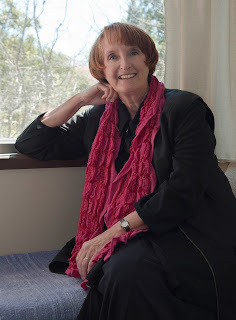 She has won several awards, including a Literature Board of the Australia Council grant to work on archaeological excavations in Egypt and Jordan; a Churchill Fellowship to study educational television in Canada; the Ethel Turner Prize in the NSW Premier's Literary Awards; four Notable Books in the Children's Book Council of Australia awards; and a bag of gold coins at a film festival in Iran. Her historical novels include When the Hipchicks Went to War (Hachette 2009), The Horses Didn't Come Home (HarperCollins 2012), Flora's War (Ford Street Publishing 2013), The Rat-catcher's Daughter (HarperCollins 2014), and Sing a Rebel Song (Omnibus 2015). Middle East 1919. In an army camp in the desert, a young Australian soldier named Harry is grooming and saddling his horse, Bunty. She is a sturdy, strong, faithful Australian waler who belongs to Harry’s younger sister, Laura, back home in Australia. Harry took Bunty into the army with him when he joined the Light Horse in 1914. As Harry finishes the grooming he stands in front of Bunty. The two of them, horse and master, are totally still. Then Harry swings up into the saddle. A few soldiers watch Harry and Bunty as they ride off into the desert. No one says a word. It’s their last ride together. This was such a sad ending to write. 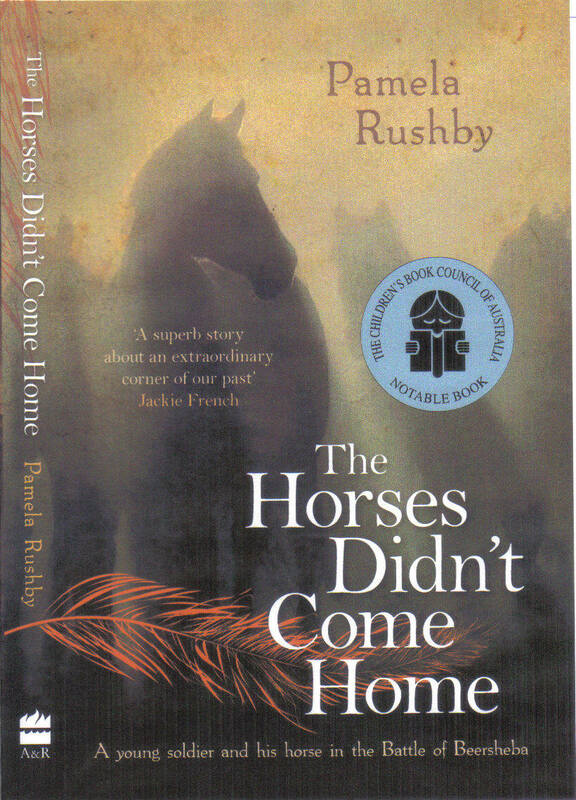 Of the 160,000 Australian horses sent overseas during World War 1, only one of them, just one, ever came home. At the end of the war, there weren’t enough ships to bring even the soldiers home. Some were still waiting in 1919. There was certainly no room for horses. So the old and sick horses were shot, and others were to be sold: to the British army (which would have been all right) or locally (which may not have been all right, given that animals were not generally well treated in the area). A few soldiers chose, instead, to take their horse for a ‘last ride’ and came back carrying the saddle, saying the horse had broken a leg and they’d had to shoot it. But what happened to the ones that were sold? Some time later, after the war, an English woman named Dorothy Brooke was on holiday in Cairo. She was horrified to see ex-war horses, sick, underfed, badly treated, pulling heavy loads. On her return to England she wrote to a newspaper, and started a fund to set up a hospital for war horses in Cairo, the Old War Horse Memorial Hospital. This provided free veterinary care for working horses and donkeys in Cairo. The charity, now called The Brooke, still operates today. Its workers treat animals in ten countries around the world, providing veterinary services and educating the animals’ owners in animal care. I was very pleased that there was a positive outcome. 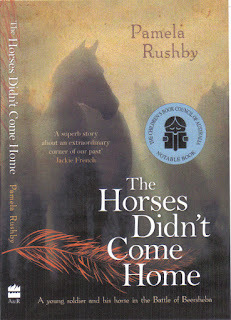 The way the horses were treated after the war horrified me. The old and sick horses were shot. But before they were shot, the army cut off their manes (which could be sold) and removed their horseshoes (also sold). Once the horses were dead, they were skinned and their hides sold. It didn’t seem much of a thank-you for their faithful service. I read a lot of soldiers’ diaries and letters while I was researching. And I came across an incident that just made me say WOW! A soldier had some leave due, and he chose to travel up the Nile to Luxor and the Valley of the Kings. While he was exploring in the Valley of the Kings, he noticed a small white tent among the rocks and sand. In it sat an Englishman, directing a group of local workers who were excavating a site in the desert. The Englishman was … Howard Carter. This was years before he became famous for discovering the tomb of Tutankhamun. The soldier actually had tea with Howard Carter! I just had to include this incident in the book.